SALT TO THE SEA IS A PHENOMENAL STORY and it bubbles over with emotional depth. 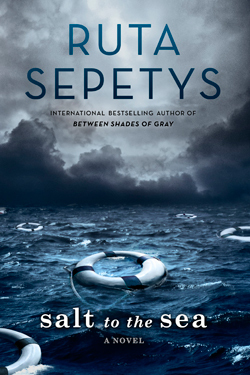 Ruta Sepetys has this incredible ability to make her characters feel like living, breathing people. Not only the main four, but there were also so many secondary characters that I fell in love with. Even if there was one character that I personally didn't agree with or like, I still felt empathy towards. Hell, I am still thinking about these characters in my day-to-day life, over a month after reading Salt to the Sea. Her writing is just so gorgeous, and it makes you truly feel as if you are taking this journey to survive with each of the four main characters. Salt to the Sea is written in such a way where each of the four MC's alternate telling the story from chapter to chapter in first person narration. This made the story so real and engaging, and I feel that it was a brilliant writing choice. Even though this is labeled as historical fiction, and EXTREMELY well researched historical fiction at that, it reads more like an historical mystery, thriller, romance combination. I was literally jumping out of my chair during parts of the book and crying my eyes out at others; while simultaneously hoping a romance would blossom between two of the characters and praying for a miracle ending at the same time. Of course we already know how this story ends. We know that over 9,000 souls lost their lives on the Wilhelm Gustloff. I knew that going into this book, it was going to end in tragedy, but Ruta has a way of bringing such light, love, and hope into what was one of the most devastating and horrific disasters in maritime history. Now, I'm not spoiling anything by saying that, as the ship that was supposed to carry over 10,000 people to safety was hit by Russian torpedoes and still sits at the bottom of the Baltic sea today. Still, there is so much that you don't know. Do the main characters all perish? Do they all find a way to survive? You will also learn when you read this book, that each character has secrets that they are hiding from themselves or others. I was actually quite surprised to find out what some of those secrets ended up being. I guess you will just have to read the book to find out! Note: I may have received a free copy of this book from the publisher for promotional purposes. Any review and/or opinions about this book are entirely my own and I was not compensated in any way.